The range of experience of SOLO taxonomy amongst attendees at the workshop put on by Andy Knill and myself at Northern Rocks 2014 yesterday was predictably varied and wide, from those seeking their initial induction to those who are leading training within their own schools and looking for where to take it next. What flowed throughout the room was a tangible current of enquiry and a seeking of effective tools of pedagogy. Things that work. Techniques that engage learners and promote their learning. SOLO has its critics, and some are valid – largely in the way it is implemented at times. But that’s likely to be true of any development initiative. All that Andy and I can say – as did many others in the room – is that it has transformed not just what we do in our classrooms, but the way we think about student progress and conceptual growth. It’s a taxonomy that has been around since Biggs and Collis developed the model in the 1980’s but has taken root in many teachers’ armoury in the last 2-3 years. So this workshop was as much a montage of our own personal journey with the taxonomy as it was sharing where we are now going with it and its potential for applying to current needs and challenges. 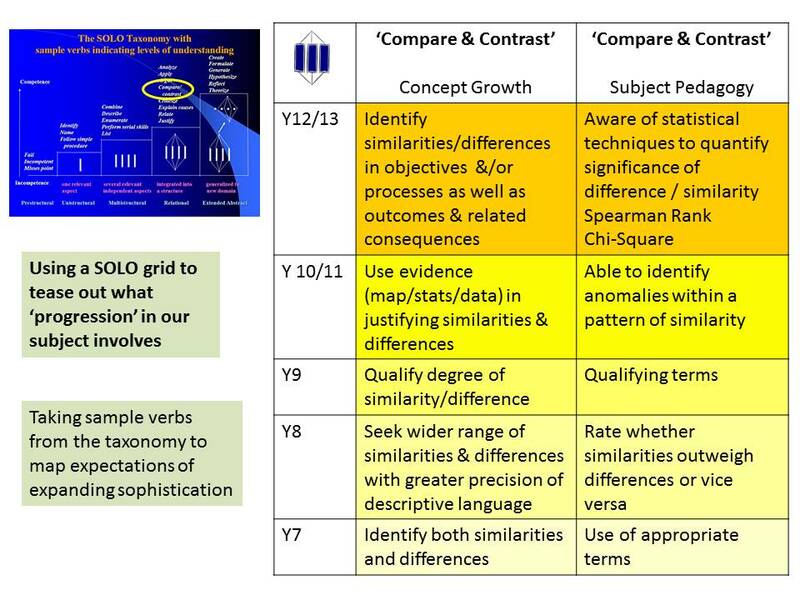 In comparison to Bloom’s taxonomy I find there are two distinct advantages: students can internalise the concepts of the key SOLO stages far more readily – particularly with the assistance of accessible symbols, and it prioritises the importance of the early stages in grounding the later knowledge-manipulation stages. There is no knowledge-skills dichotomy, the sophistication of the deeper learning is built upon, and depends upon, the sophistication of the knowledge that has been accumulated. Eighteen months into its use, I use SOLO daily – sometimes with students being deliberately aware, but more often not. In planning lessons I now frame the objectives around SOLO concepts. It doesn’t necessarily mean I attempt a scattergun coverage of all of them each lesson – in early stages of a unit we may be focusing on developing accurate, precise, validated information at the ‘multistructural’ level, but I’m always quizzing the initial lesson outline to see whether opportunities for deeper thinking activities lie hidden and would benefit from a SOLO light being shone into corners. It’s resulted in a lot of lesson-plans from over 2 years ago being revised and substantially improved upon. Students may be asked to work with the SOLO symbols in accessing increasingly deeper levels of task-challenge or, alternatively, self-selecting (in reality, discussed-guidance) tasks from a menu. It takes a few lesson for them to get their heads around what the symbols represent but, having introduced it to all year groups from Y8 to Y13 I’ve yet to find a group that can’t access the ideas after some practice and exemplification. (Might not be best to introduce your very first lesson in it, as I did, with a Y8 group on the day Ofsted visited. The prayers of thanks that the lesson didn’t get a visit following my attempt to ‘take risks’ are still floating upwards. It does take repetition – but do persist. It’s worth it. I posted about introducing SOLO here). 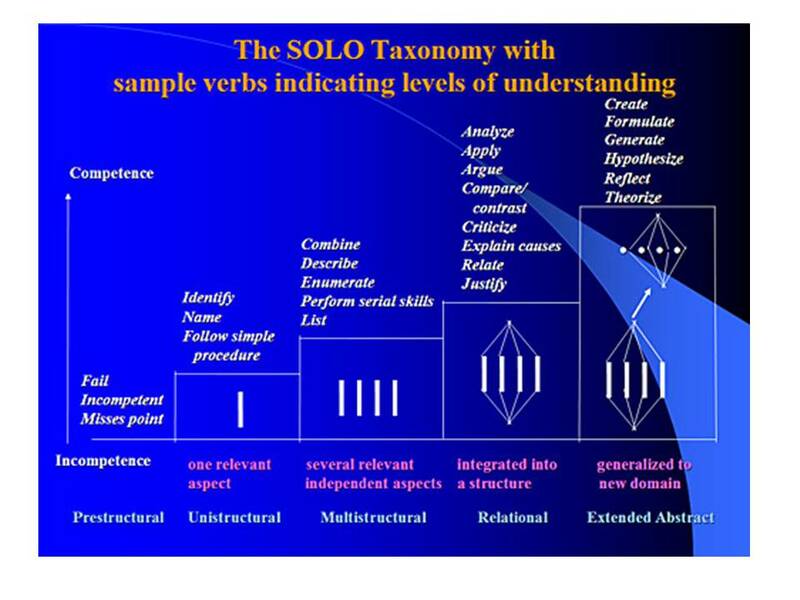 The creative uses of SOLO by teachers in primary through to further education sectors, in subjects from PE to Languages, Science to Art have been the real validation of the taxonomy. It was this richness of thought that Andy Knill (@aknill) believed should be captured in one twitter account of shared value. 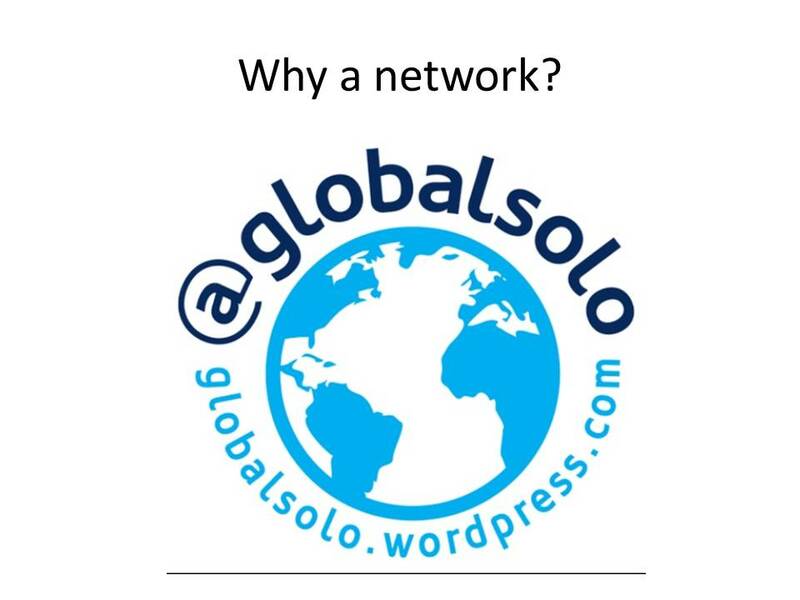 @globalsolo was created at the start of 2014 and now has a following of over 13oo SOLO users across the world. It is a meeting place of advice, examples, enquiries and answers. Andy’s summer project is to construct a database of SOLO users so that interested participants can search by education stage, subject, region …. It will hopefully become the go-to for advice on initial engagement with SOLO, and for the more experienced to get ideas of where to take it. 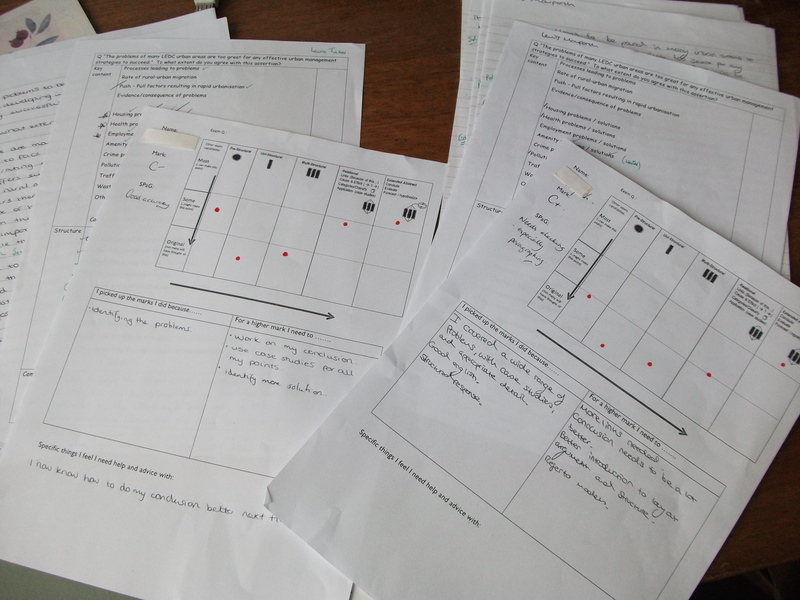 In my own practice the areas which I’ve been re-framing via the SOLO template have included feedback, group-work, and curriculum development. This dimension was instigated by the (valid) criticism that SOLO can generate a superficial response by students to the early ‘knowledge’ stages as they try to drive through to the ‘end-point’ of Extended Abstract – ending up with superficiality and generalisation; a shallow process resulting in shallow learning. 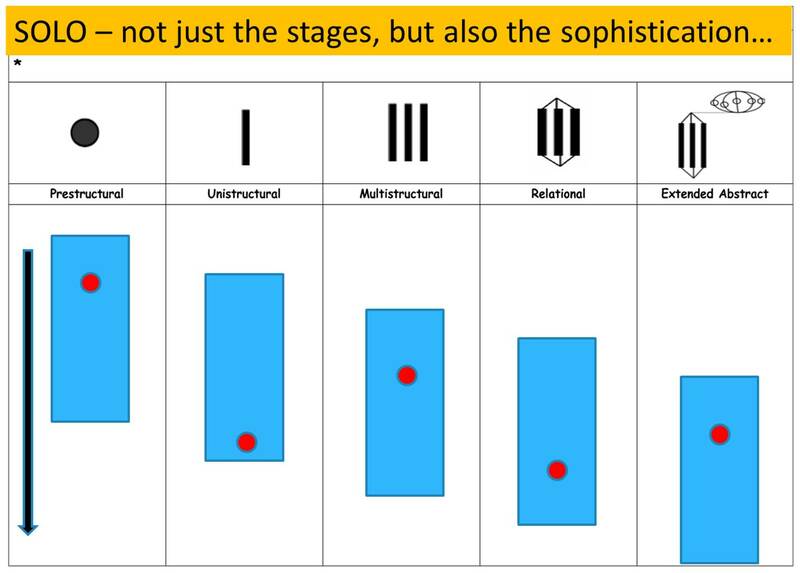 We need to expressly clarify and demonstrate the level of sophistication we want them to achieve at each of the SOLO stages if we are processing the taxonomy effectively. ‘Unistructural’ information can be bland and ubiquitous – or it can be sophisticated, precise and original. There’s a need to clarify the latter – appropriate to the age-group we are teaching. This led to (this post) about developing 2D and 3D thinking in SOLO. Transferring the need to cultivate written assessements that ultimately matched the depth of thinking I was able to witness students argue (or hexagon-link) in the build-up lessons, but which too-frequently failed to mature into equally high-quality responses, I put the SOLO taxonomy to work on starter phrases that we had dabbled with when sharing connectives. The wordmat that emerged has withstood the fire of battle (well – Year 9 assessments this year) and proved a helpful assist in relating quality of writing more directly to quality of thinking. It has also proved one of the most retweeted images I’ve made available and seems to be serving a need many others find problematic. Another key need to address has been group-work and trying to make it effective. Not because of a need to ‘do’ groupwork per se – I’m not a natural ‘group-ey’ in my classroom, but for some tasks it has a value that needs engaging with. But too often group-work doesn’t have sufficient pre-planning to make it of optimum value. 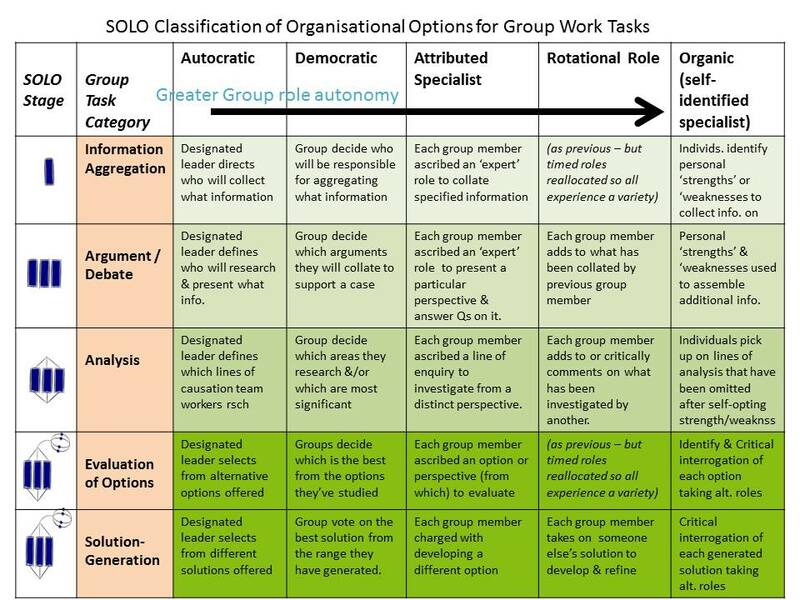 The SOLO group-work post (to be found here) is an attempt to apply SOLO thinking to the key formats that group work should consider in matching task and desired outcome to organisation format. 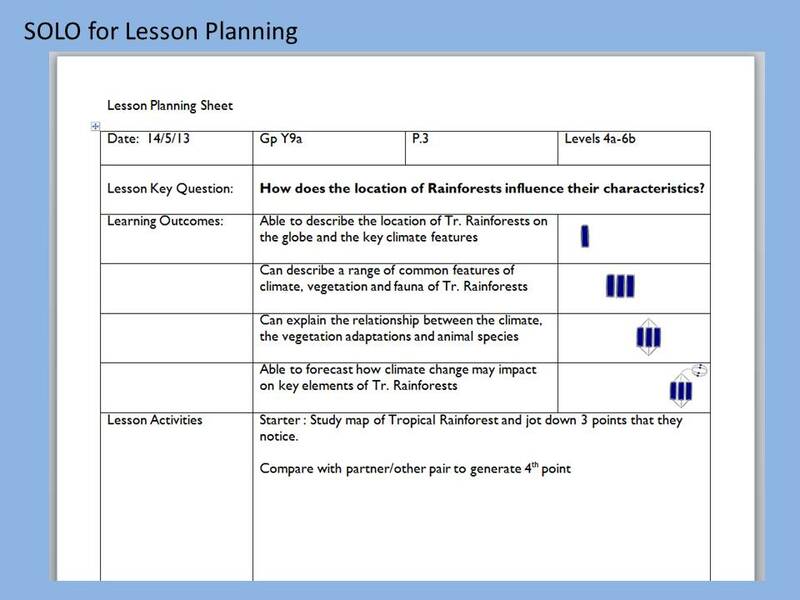 I’ve used it this year with KS3 groups in particular, depending on the task, which has depended on the point we’re at within the unit. I’ve been happier in that it’s given me the basic criteria for success and opened up discussion with students both before and after the exercise about the nature of working collaboratively – the pitfalls and the benefits, and how to maximise the latter. And the current direction in which the SOLO net is being cast? We’re thinking about post-levels assessment. To be honest – any gradation of ability on a linear scale is going to be by ‘levels’, whether we call them ‘grades’, ‘capacities’ or ‘way-markers’. But we’re using the opportunity to think more about profiling student performance rather than reducing it to singularities of description. I’m currently working with the department on teasing out each of the descriptive verbs of each SOLO stage related to subject genre to attach a ‘what is to be aimed for’ in each year to build up to realms of breadth, depth and sophistication by Y13. An eleven-year old can ‘compare & contrast’, as can an eighteen-year old. 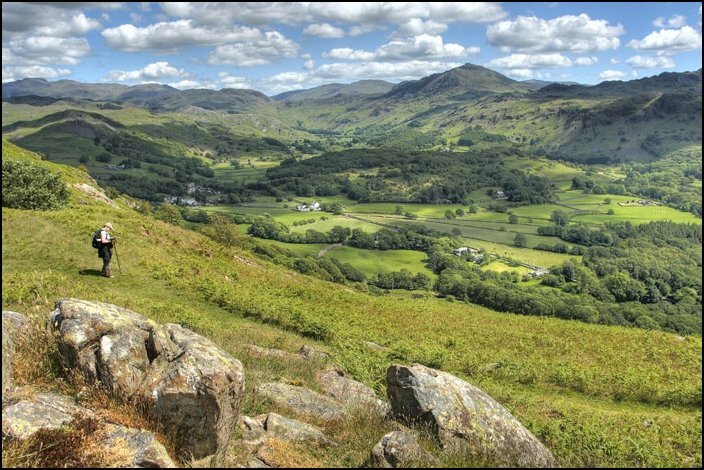 So what do we expect to have developed in that capacity, within the experience of geography, as we revisit the component over the years in subject pedagogy? This will hopefully build into a spiral curriculum of expanding competence and mastery with a planned framework against which to chart the progress of students in various dimensions – a profiling of abilities and areas to focus upon. There are other areas to which I want to apply the mantle of SOLO. As each arena yields benefits of insight and potential, you find yourself thinking ‘What would a SOLO interpretation of ‘x’ or ‘y’ look like?’ This is a journey that is unlikely to reach a destination. But it is providing clarity of direction and unexpected vistas that are worth every pace of the climb. 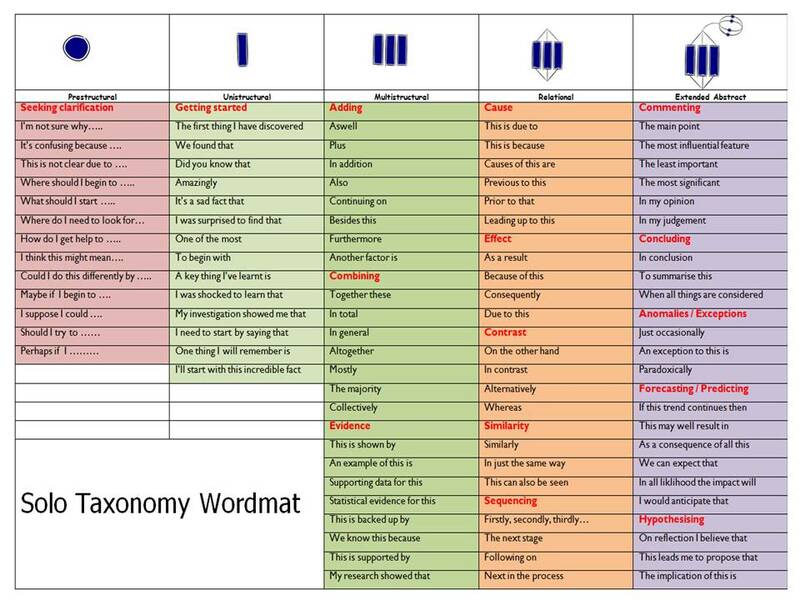 The SOLO taxonomy wordmat is available from the @Dropbox account here . Download, save and amend to suit your subject and age-phase.